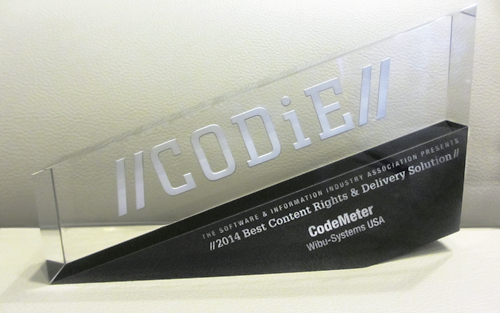 Wibu-Systems announces that CodeMeter®, its flagship software copy protection and licensing solution, won the 2014 SIIA CODiE Award for Best Content Rights and Delivery Solution. CODiE award winners represent the information industry's best products, technologies, and services created by or for media, publishers, and information services providers. CodeMeter, the most secure platform for license management and content protection, provides an all-in-one solution for monetization of software, documents and digital media. CodeMeter's License Central component can be fully integrated with a software publisher's existing business processes and allows for highly flexible licensing of content that can be tailored to their customer's size, location, or markets. This flexibility includes monetization options applicable for low-price mass-market content and high value specialty industries such as engineering and financial software. CodeMeter supports all major platforms - Windows, MacOS, Linux, cloud, mobile, as well as real time operating systems like VxWorks, QNX, and others. "We are honored to be recognized as the best in class software protection and licensing solution," said Marcellus Buchheit, co-founder of Wibu-Systems and CEO of Wibu-Systems USA. "Wibu-Systems has been dedicated to protecting valuable digital assets for over 25 years." "SIIA's 2014 Content CODiE Award winners' are some of the most innovative, high-impact content products out there," said SIIA Vice President and General Manager for the Content Division, Kathy Greenler Sexton. "We congratulate all of this year's CODiE Award winners, and thank them for the contributions they have made to the information industry." Winners were announced during a special Awards luncheon on January 30 in New York City during the SIIA's annual conference for information industry leaders, IIS 2014: Breakthrough. The SIIA CODiE Awards are the industry's only peer-reviewed awards program. The first round review of all nominees is conducted by media, publishing, and information services executives with considerable industry expertise, including members of the industry, analysts, media and bloggers, and bankers and investors. The judges are responsible for selecting the CODiE Awards finalists. SIIA members then vote on the finalist products and the scores from both rounds are tabulated to select the winners.